Clann & Caidrimh: Katy Daly (iníon), Jay O’Connor (garmhac), Deirdre Daly (iníon), Conall Daly (mac), John Joe Daly (iarfhear céile), Ferdia Mac Aodha (fear céile). Bean stuama macánta is ea Noreen. Is duine láidir í agus an-acmhainn oibre aici. Ag obair i monarchan i nGaoth Dobhair a bhí sí nuair a chas sí le John Joe gan í ach seacht mbliana déag d’aois. Phós siad go hóg agus bhí clann de thriúr orthu taobh istigh d’achar gairid. Rug an t-uaigneas ar Noreen agus í fághta aisti féin leis na gasúir fad is a bhí John Joe ag obair i bhfad ó bhaile. Bhí an t-airgead gann agus dhéanfadh John Joe iarracht tuilleadh a shaothrú le seift nó margadh cam anseo is ansiúd. D’éirigh Noreen bréan do na margaí suaracha seo agus an cur i gcéill uilig agus diaidh ar ndiaidh mealladh a croí ag fear comharsan, Ferdia. 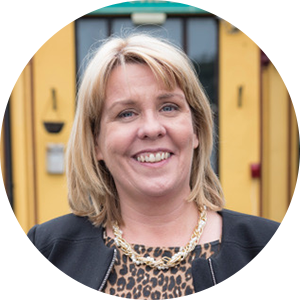 Tar éis troid fhíochmhar le John Joe d’imigh seisean leis go Ros na Rún agus fágadh Noreen, Ferdia agus na gasúir le chéile i nDún na nGall. Dá thoradh seo is é Ferdia a bhí ina athair ag na páistí níos mó ná a n-athair féin le linn a n-óige. Tá síocháin déanta ag John Joe agus Noreen le blianta anuas agus a gclann iníonacha ag maireachtáil i Ros na Rún. Is cuma léi sa sioc anois faoina chamscéimeanna mar nach mbaineann siad léi!